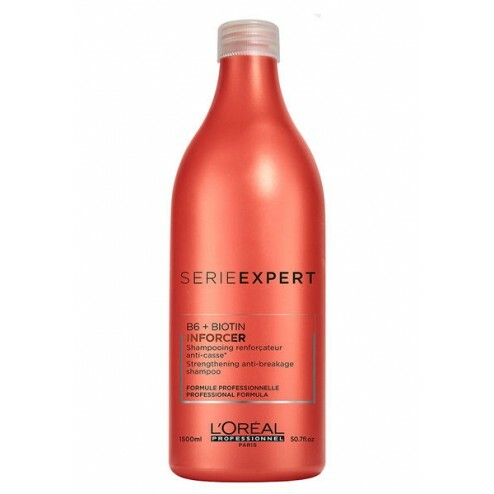 A strengthening anti-breakage shampoo for normal to fragile hair. *After 5 applications, compared to control shampoo. AQUA / WATER • SODIUM LAURETH SULFATE • SODIUM CHLORIDE • COCAMIDOPROPYL BETAINE • DIMETHICONE • SODIUM BENZOATE • AMODIMETHICONE • CARBOMER • GUAR HYDROXYPROPYLTRIMONIUM CHLORIDE • TRIDECETH-10 • GLYCERIN • HEXYLENE GLYCOL • SALICYLIC ACID • GLYCOL DISTEARATE • PYRIDOXINE HCl • CITRIC ACID • MICA • LIMONENE • PEG-100 STEARATE • STEARETH-6 • PHENOXYETHANOL • COCO-BETAINE • TRIDECETH-3 • CI 77891 / TITANIUM DIOXIDE • PEG-45M • BENZYL SALICYLATE • BIOTIN • LINALOOL • GERANIOL • BENZYL ALCOHOL • ACETIC ACID • FUMARIC ACID • CI 15510 / ORANGE 4 • CI 17200 / RED 33 • BHT • SODIUM HYDROXIDE • PARFUM / FRAGRANCE.